Iwaki, Fukushima, Japan—At 11:00 in the morning, on May 18, stern faced and serious “Hula Girls” at the Spa Resort Hawaiian worked on their blocking for a special “one off” performance for Prime Minister Shinzo Abe and the Presidents and Prime Ministers of Pacific Island nations in their dance studio at Spa Resort Hawaiian in Iwaki, Fukushima. But when their regular daily show at the world famous Spa Resort Hawaiian began at 1:30 in the afternoon, their faces lit up with huge smiles as they performed dances from several Pacific Island nations. It’s was the same at the regular 7:30 pm show. They’ve done those shows many times but the special show for the leaders was a one-time event. 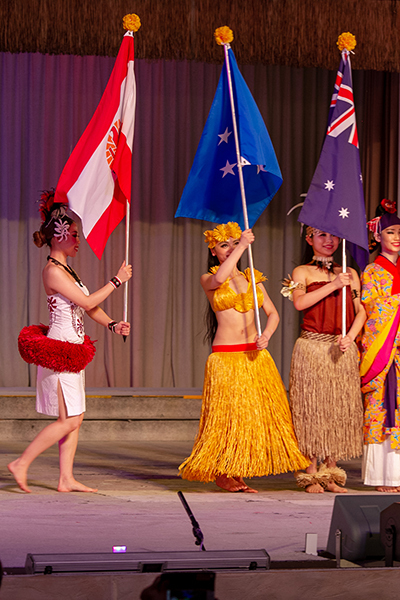 Costumers created stylized outfits for them to represent each of the 19 Pacific Island countries that were present at the show at the 8:45 pm show. On the stage, each country’s flag was represented. The dancers lined the stage at the beginning of the special show and waited. 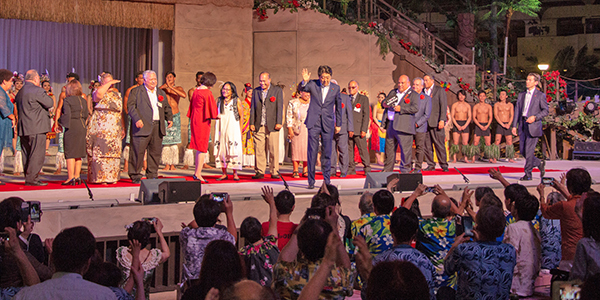 A voice from the stage announced to the large gathered crowd that Prime Minister Abe and the leaders of the Pacific Islands whose indigenous dances have been portrayed on that very stage are in the balcony. Hotel guests, dressed in the “uniforms” left in the rooms of each guest appeared to be shocked and amazed at the presence of the leaders and rushed forward to the stage to turn and look up to balcony to wave and take photos of their leader and his colleagues from the Pacific Islands nations. The standing ovation went on for nearly 10 minutes before the show started with a special added performance by the visiting under 18 Samoa Rugby team who were in Japan to play a friendly match with a similarly aged team in Japan. When the show was over, the Pacific Island leaders took to the stage to take a bow and to greet the dancers representing their countries. Many people are not aware that, though hula dancing certainly did not originate in Japan there are far more hula dancers there than there are in Hawaii. Estimates on the number of people in Japan who take part in hula classes or are members of a halau range anywhere from 500,000 to 2 million people, while in Hawaii there are approximately 50,000 practitioners. In Hawaii, many hula instructors and musicians have found it difficult to make a living. Many of them make several trips to Japan each year where their talents are monetarily appreciated. Japan’s love affair with Hawaii is not a new thing having its roots when the first Japanese settlers began to arrive over 100 years ago. King Kamehameha welcomed eight nearly starving Japanese sailors whose ship was found drifting in 1806. A visit to Japan by the king of Hawaii to meet with Emperor Meiji Mutsuhito in 1881 further solidified the relationship between Japan and Hawaii. In 1966, the first Hawaiian themed resort in Japan opened in Iwaki, Fukushima with center pieces of hot springs and hula dancers. It was first called the Joban Hawaiian Center but changed its name to Spa Resort Hawaiian in 1990. By 1971, the resort was averaging over one and a half million visitors per year and that number was maintained through 2004. In 2005, a movie about the founding of the resort brought in another surge of visitors. Iwaki was once a coal mining town but when demand for coal decreased in favor of oil, the economy was in danger. The town leaders founded the resort as a way to rescue Iwaki’s economy. The resort was damaged in an aftershock of the earthquakes of 2011 and was forced to close. 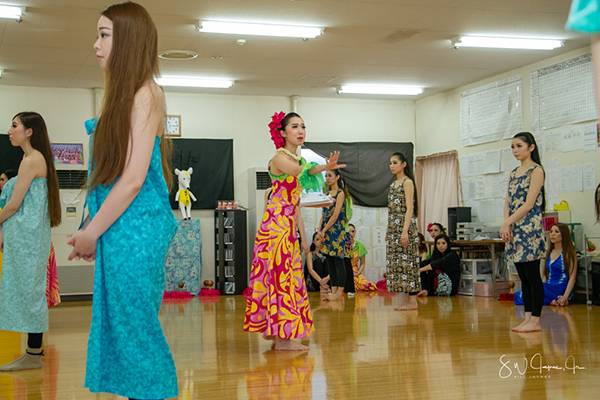 While the resort was closed, the world famous hula dancers toured Japan performing at earthquake refugee shelters and other venues. The resort re-opened in 2012 but fear of radiation from the damaged Fukushima Daichi nuclear plant kept tourists away. The effects of the fears on Iwaki’s reputation as a tourist destination were even more difficult than the closing of the mines in 1966. Fukushima is still working on that problem. But in the last few years, tourists have begun to return in large numbers, partially due to the promotion and good will of Japan’s famous hula girls. 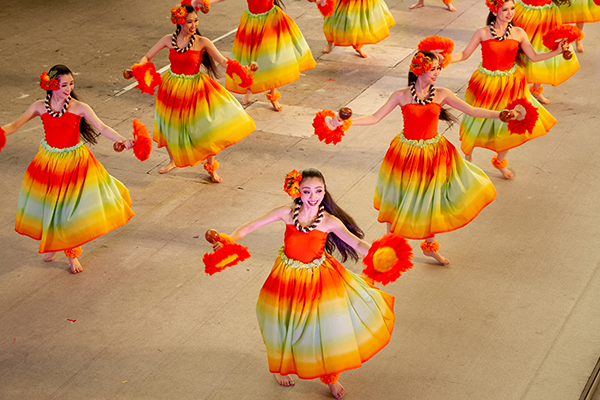 In two shows each day, the dancers perform not just hula but dances from New Zealand, the Cook Islands, Fiji, Samoa, Tahiti, and of course, Hawaii.